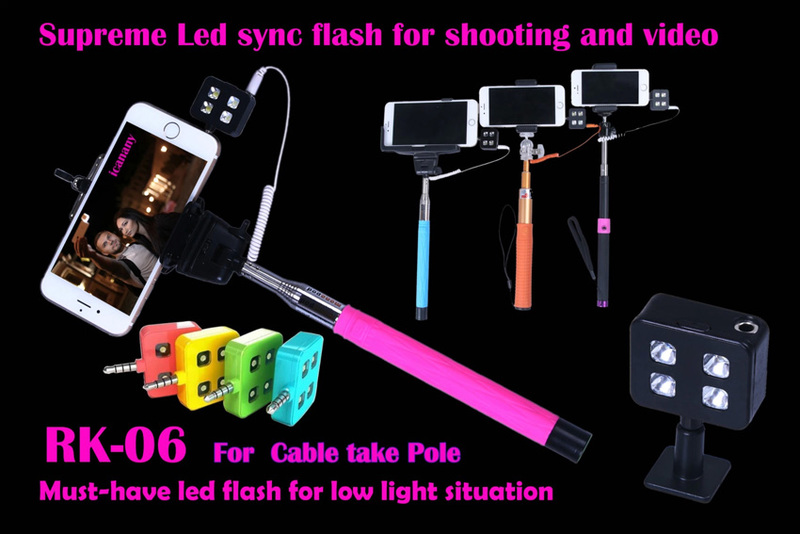 The wire monopod using led flash is unique Compared with all other existed flash light. 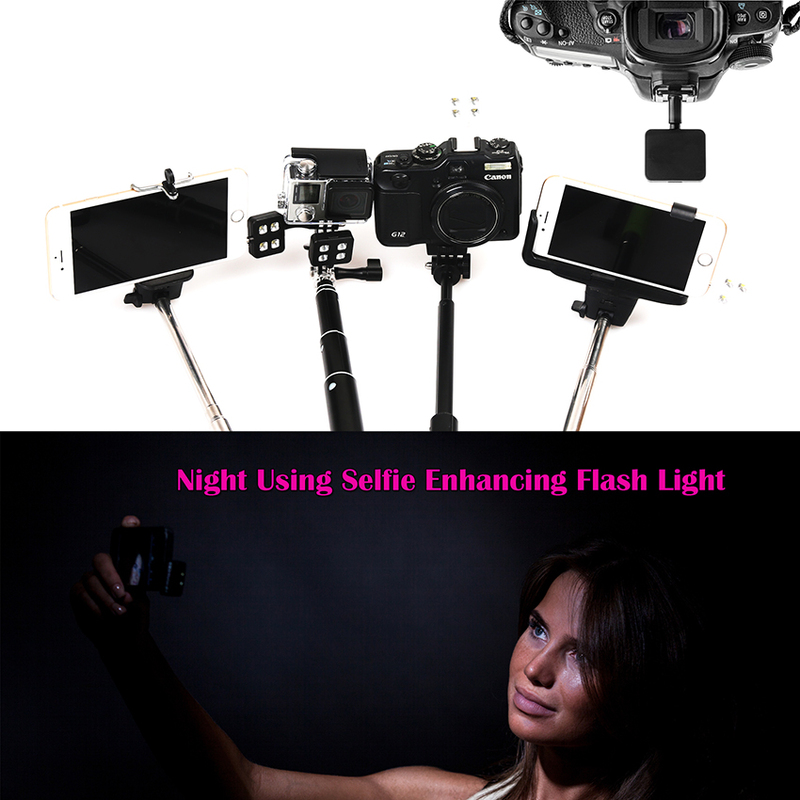 It is the world's first one which is designed to using the wire monopod so to be the sync light. 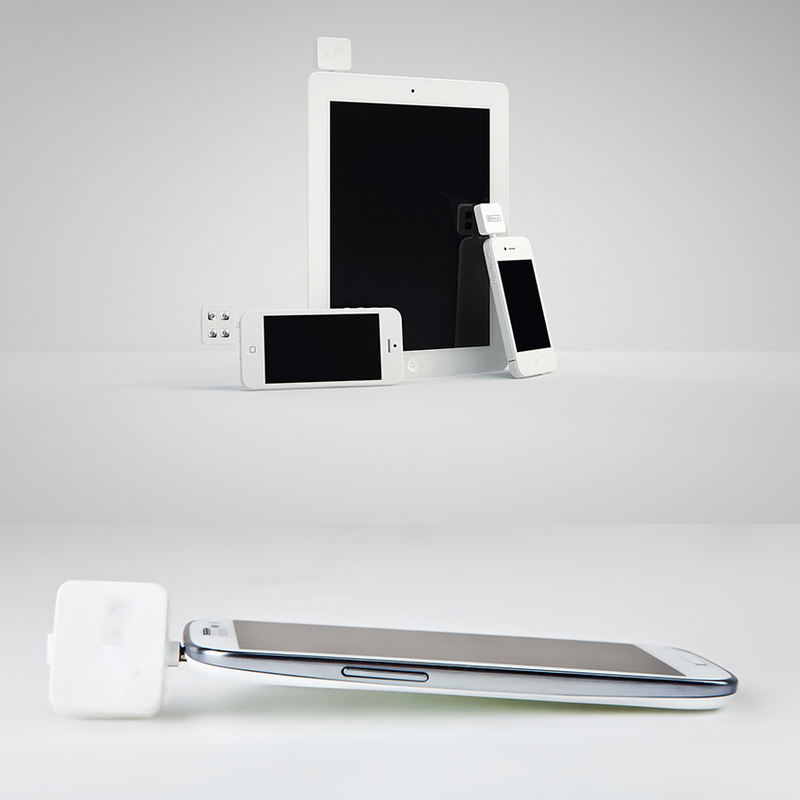 What’s more, no need to store any app and can be compatible for smart phone and pad stored ios and android system. 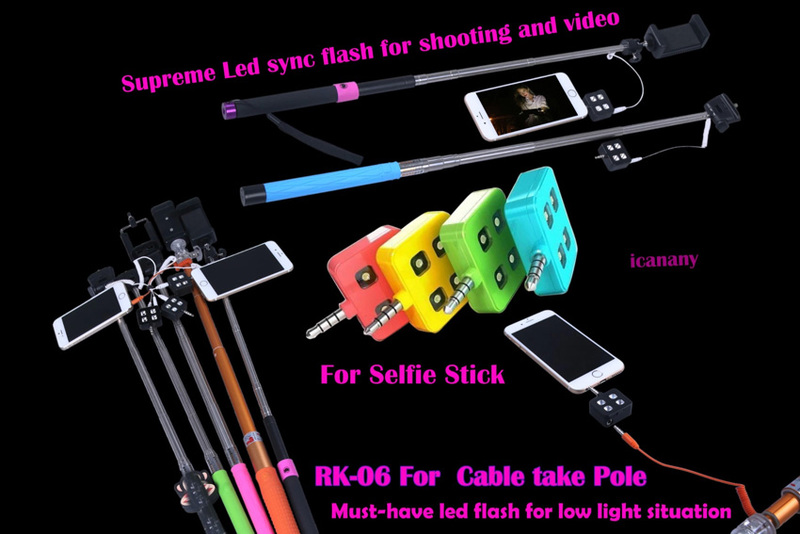 Rk06 also can be used for Bluetooth selfie sticks and self-timers. 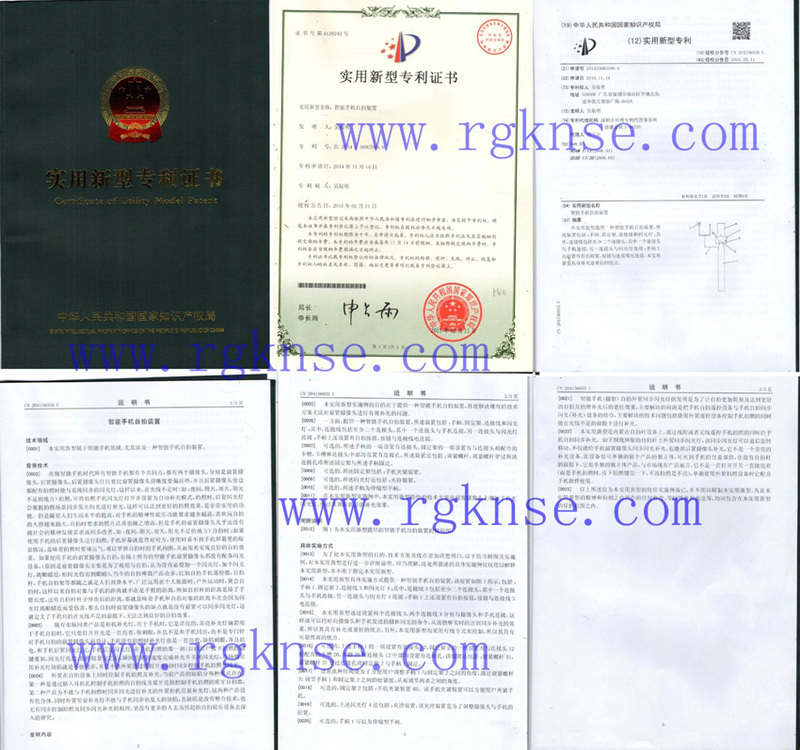 We have gotten utility model patent and at the same time designed neutral packing for export. Any imitation is prohibited. It must be the hot product in 2015. 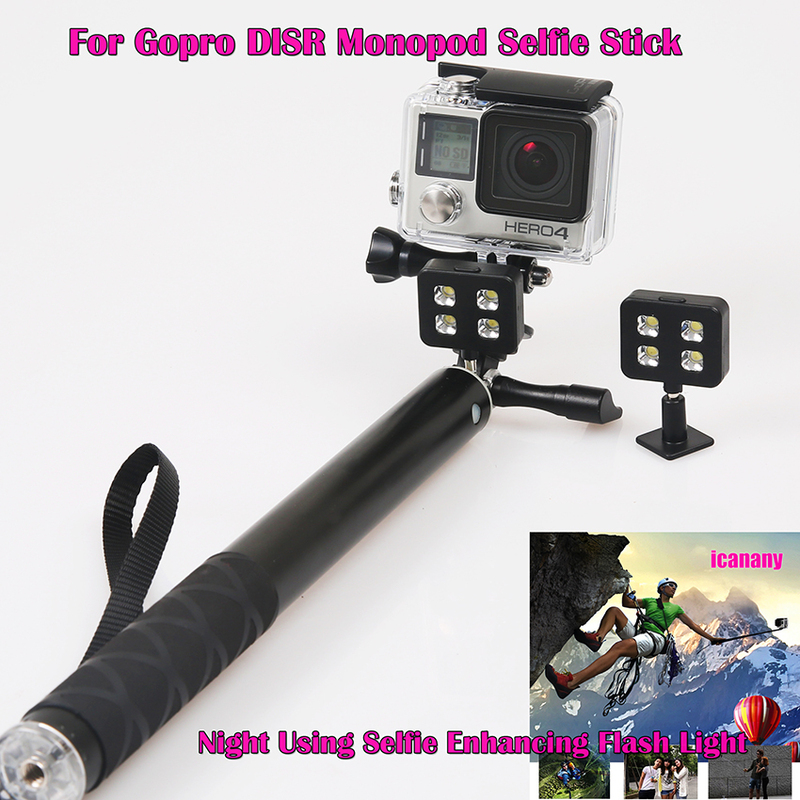 As the hot sale wire monopod increasing, RK06 become the hot sale is the trend. You are welcome to catch the good business opportunity. 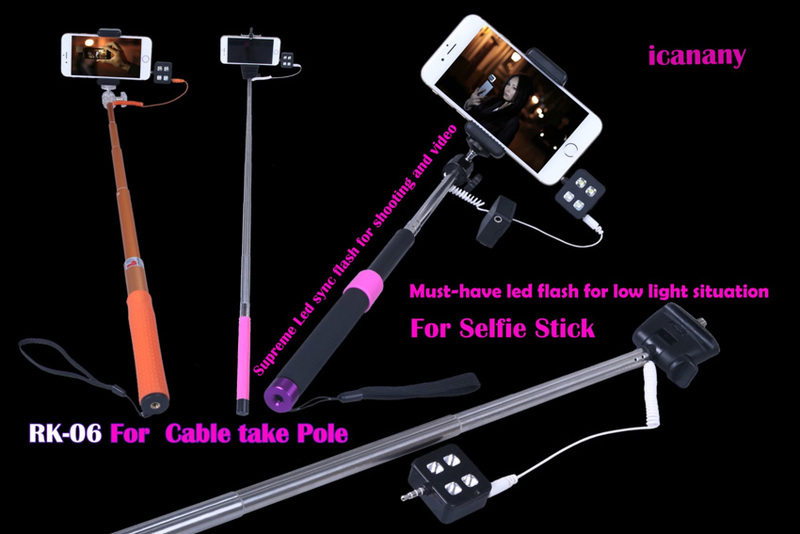 As the increasingly spring up, Bluetooth self-timer, selfie stick, camera tripods are the favorite items of these guys who love selfies. 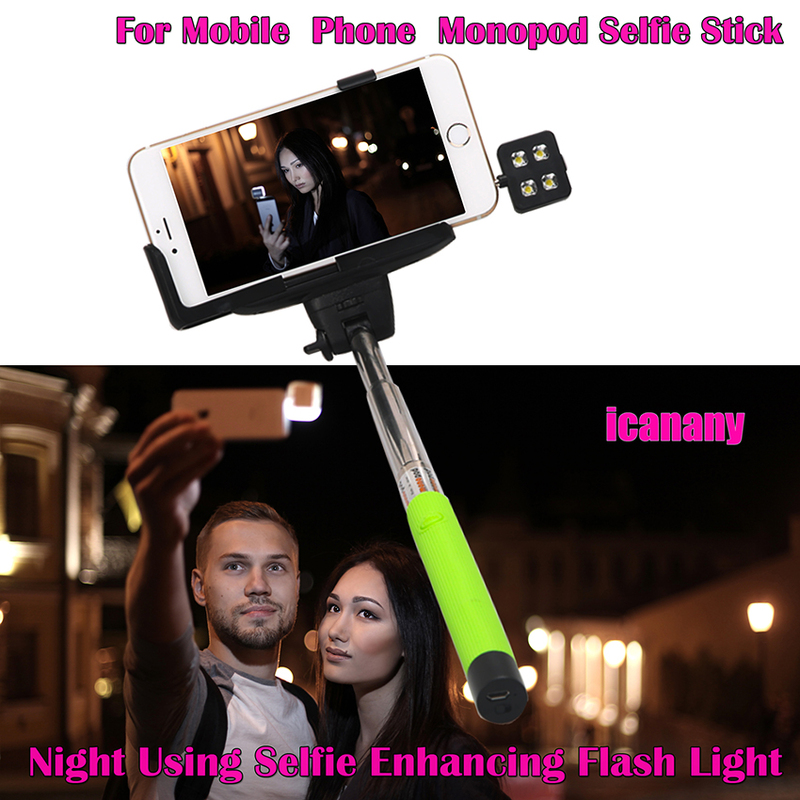 At the same time, they concern more about the selfie effects. When take selfies, they want get better results so can leave a deep impact on their happy time. 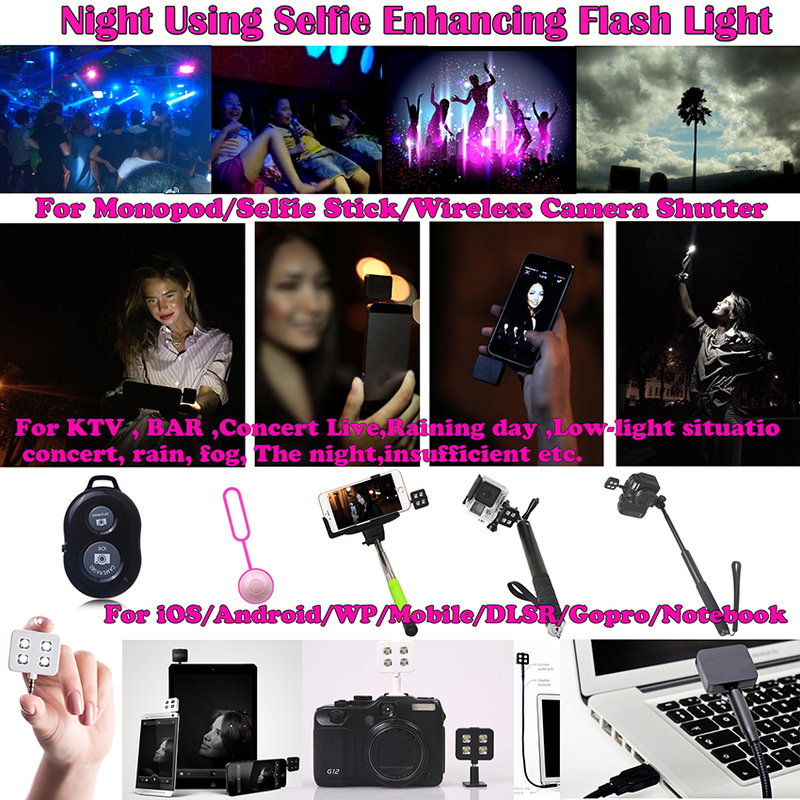 When you want to take selfies, especially in KTV, BAR, Concert, raining day, even some action sports in night, the results are not good even vague due to the low-light. At this time, you will feel helpless. However, most smart phone just built-in flash for rear camera but for front camera. Funny, the front cameras are mostly used to take selfies. 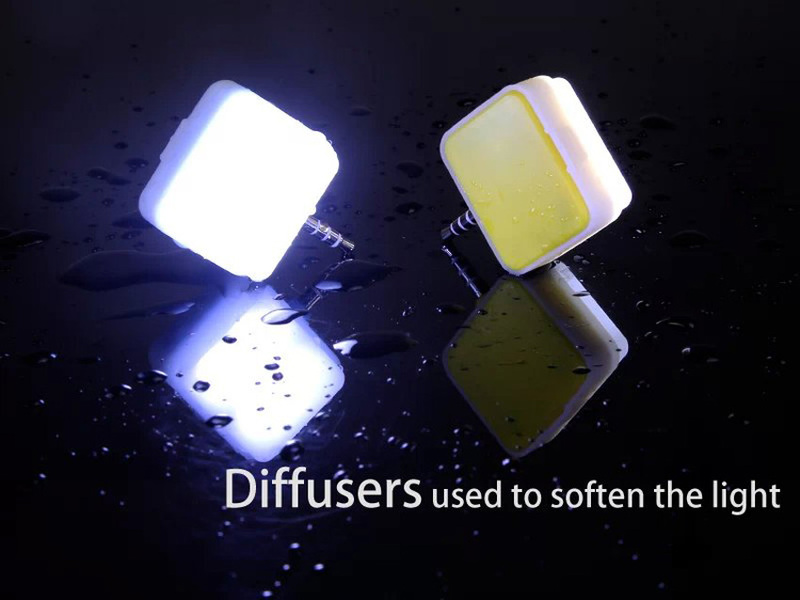 That is to say, the result will be influenced by the dark environment which affects users’ mood at the same time. 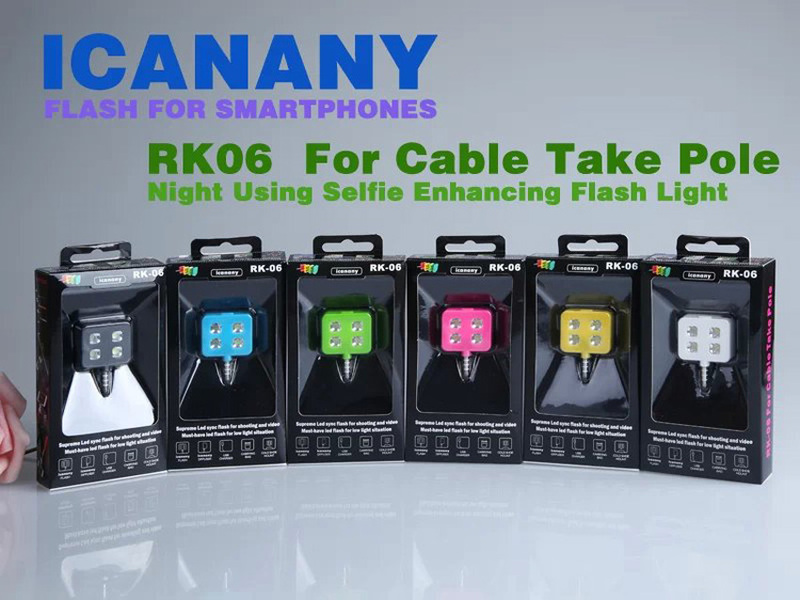 RGKNSE Icanany, the professional selfie searching team has successfully developed an external sync led flash to save these problems. 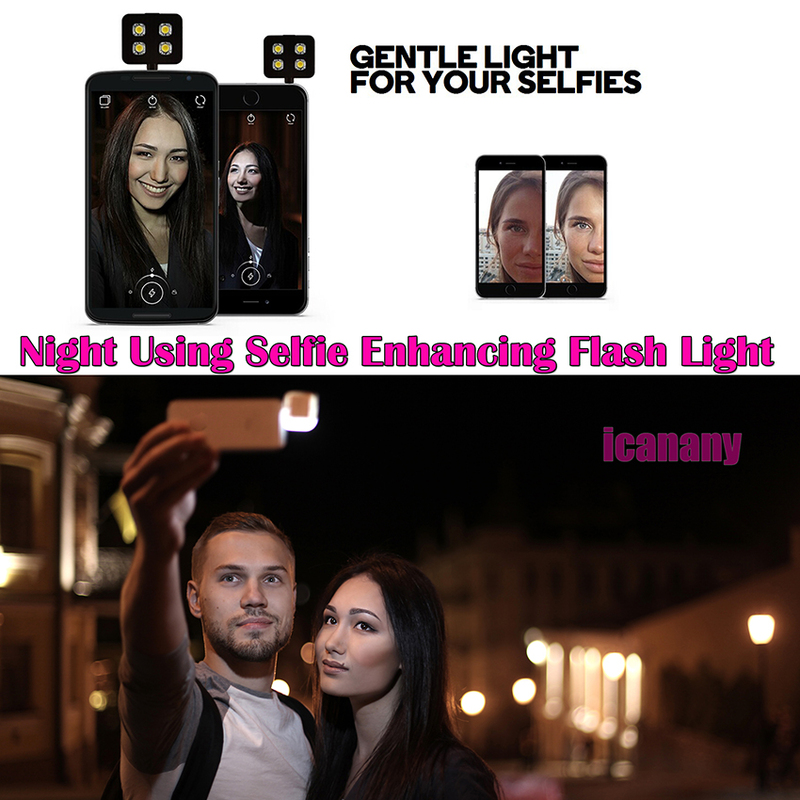 Already been authorized the Utility Model Patent with patent number 2014206835999, it is the patented selfie enhancing led flash. Counterfeit will be sued. 1：1. 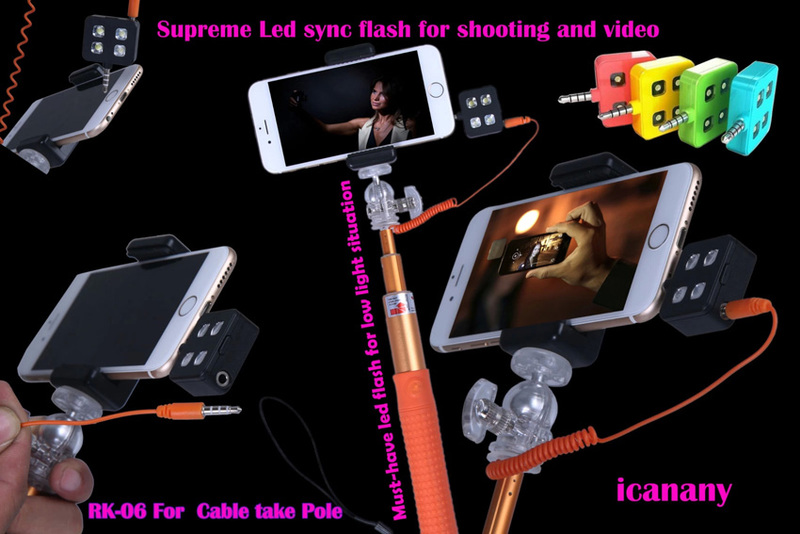 It is the world's first one which is designed to using the wire monopod so to be the sync light. 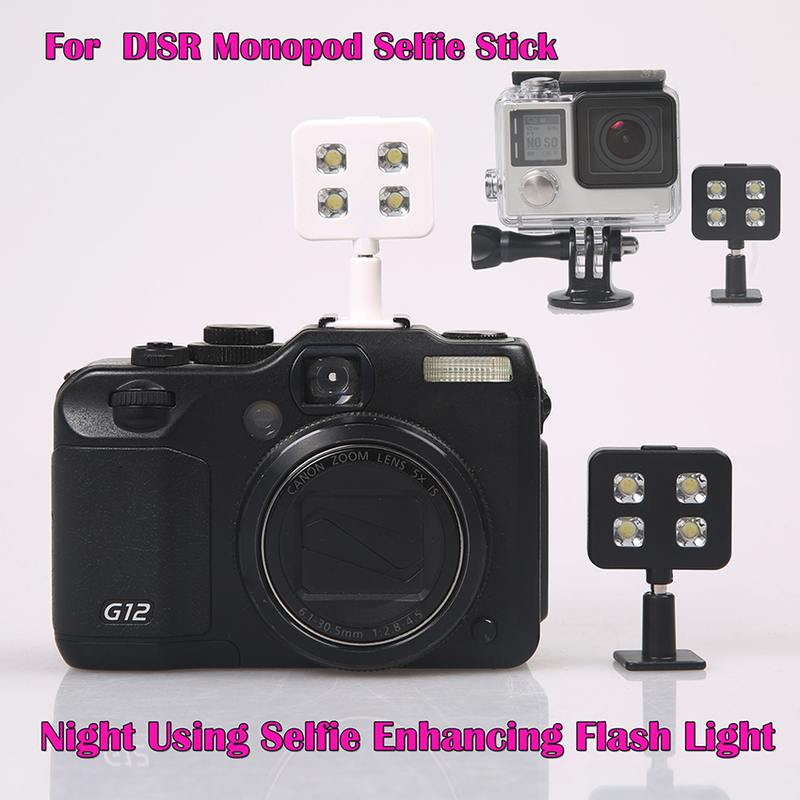 Other existed led flash in the market have no 3.5mm port which means it can not act as the sync flash for wire monopod. 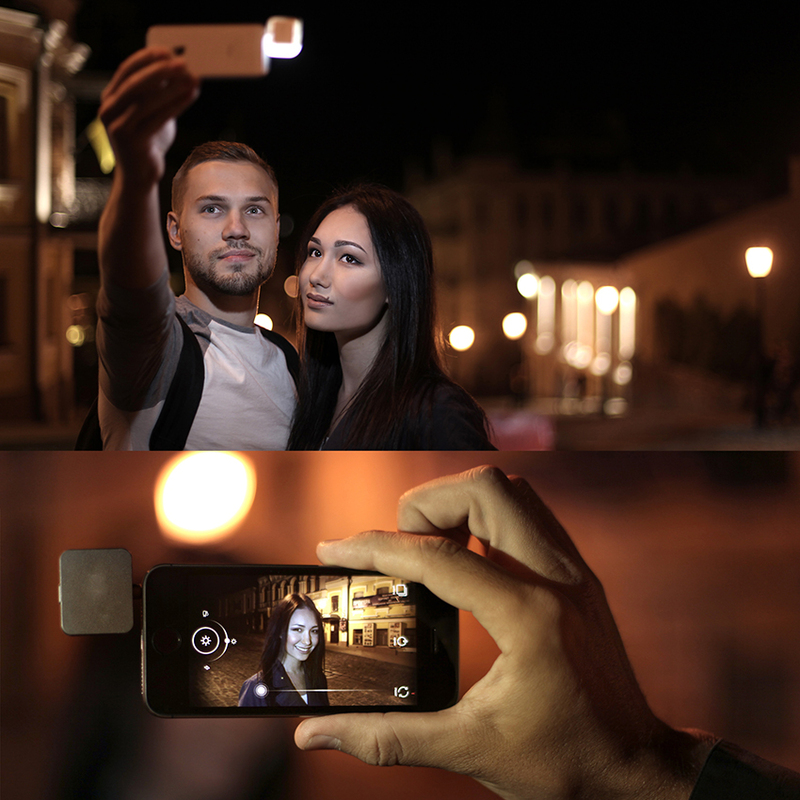 2：Get superior selfies in low-light occasion. 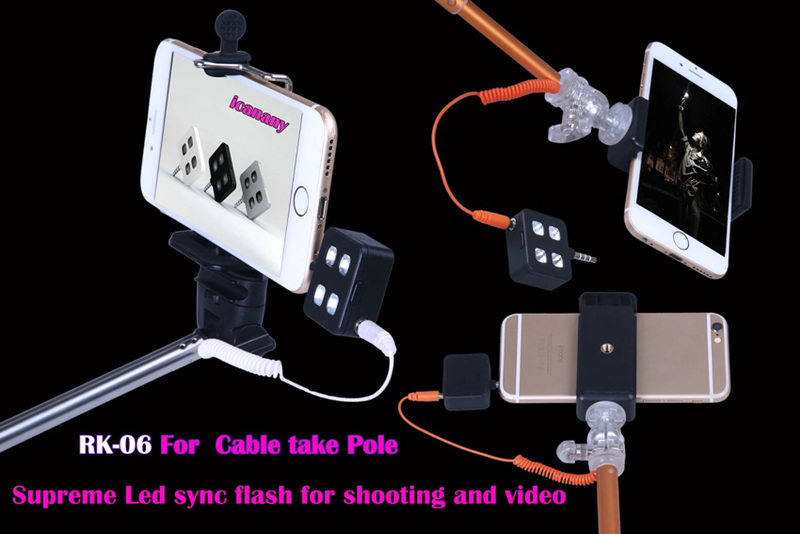 It can provide the higer quality pictures and videos even in low-light place such as KTV, BAR, Concert, raining day, even some action sports in night. 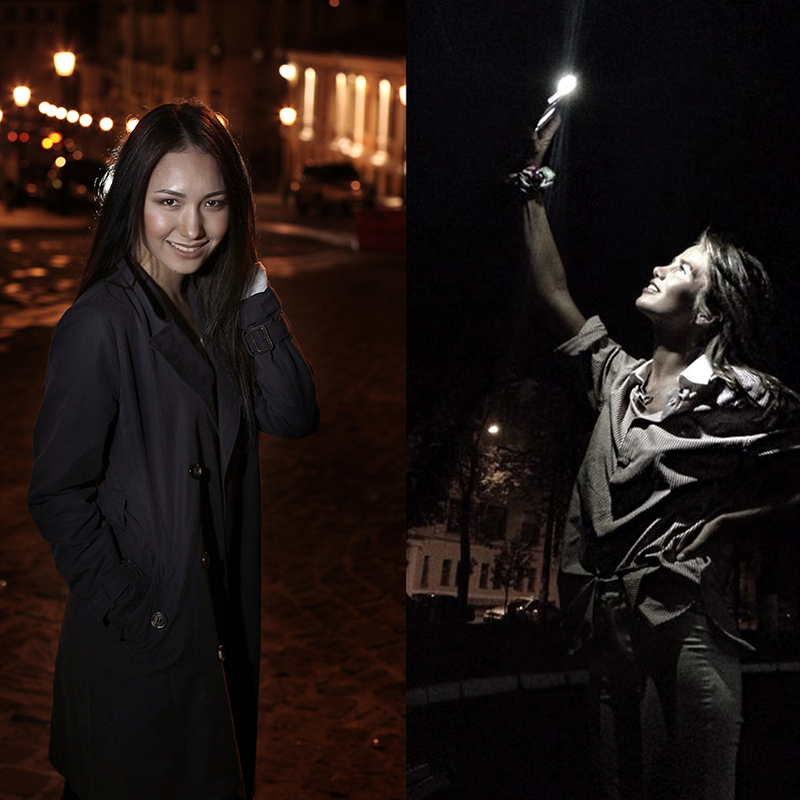 3： Generally used led flash. 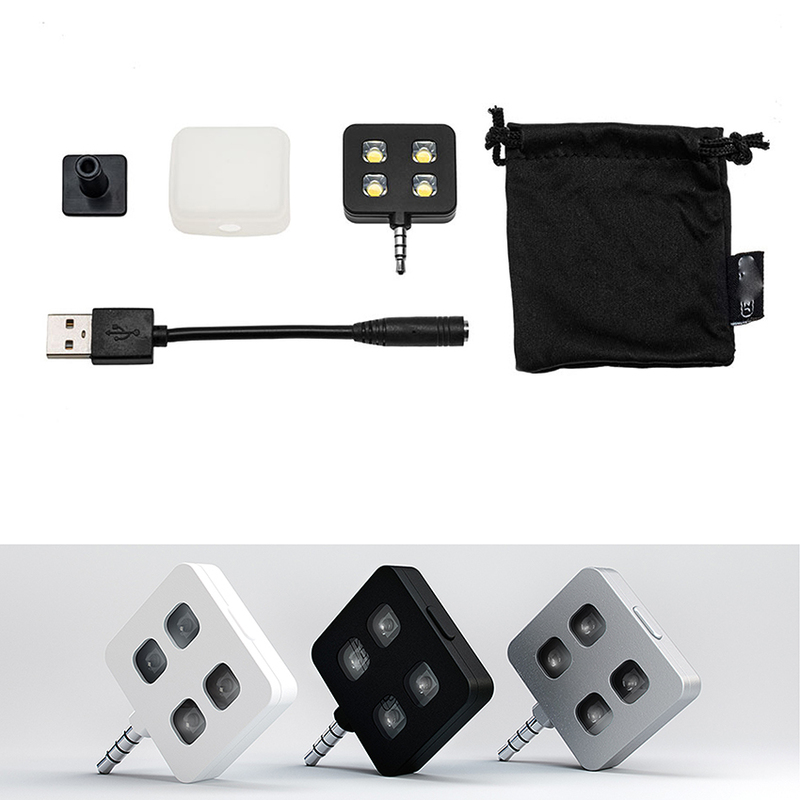 The smart led flash can be general suitable for all smart phone (android, ios, wp systems), DSLR, PC, PAD AND Go pro sports cameras. 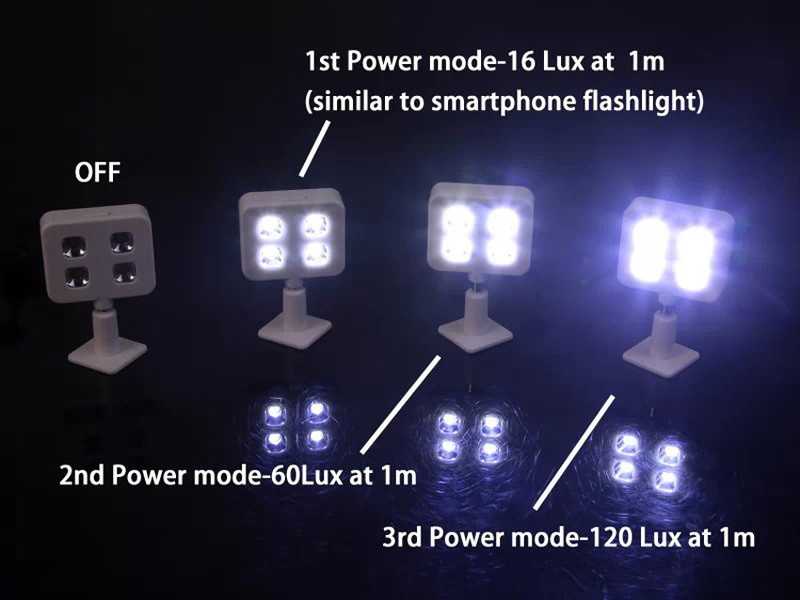 It is the first portable multifunctional led flash built-in 4 lights. 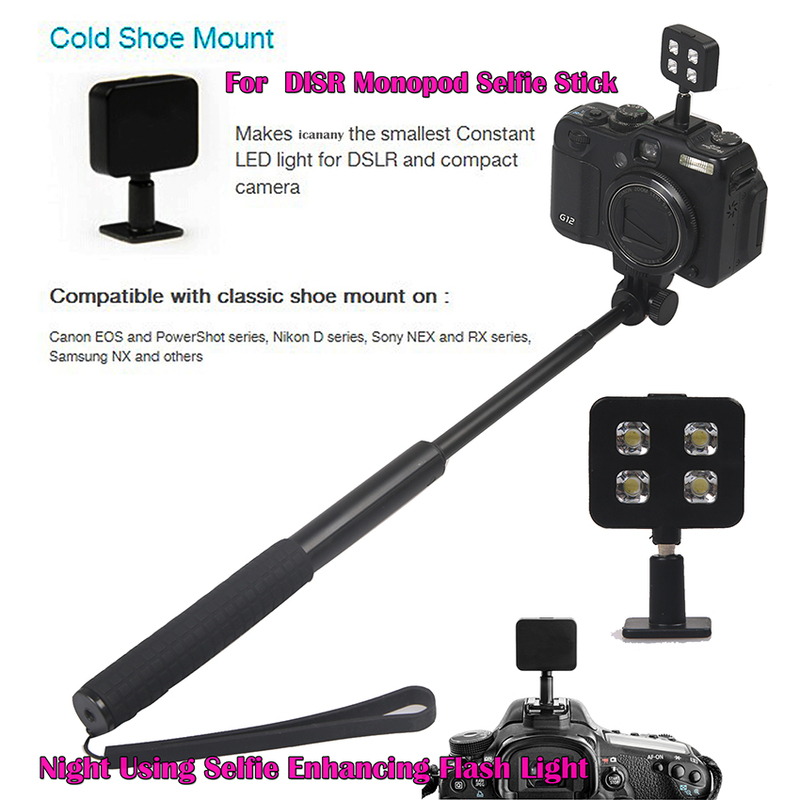 It can fully meet the international standard of advanced photographic equipment. 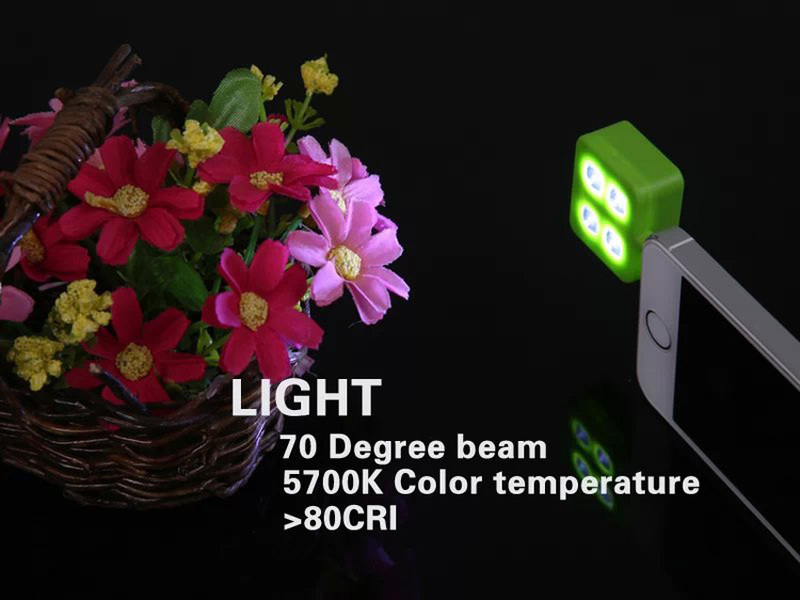 Such as 70 Degree beam, 5600k color temperature and 80 CRI. 4：Adjustable brightness. 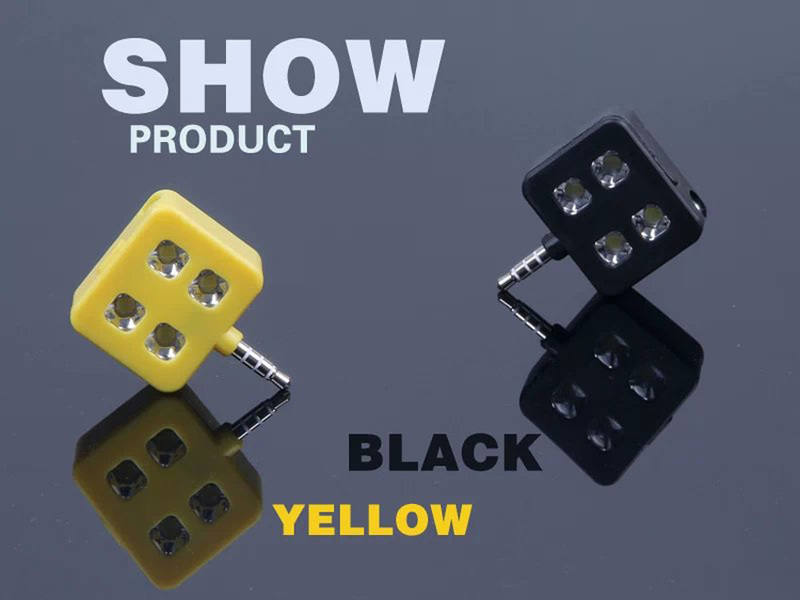 The lightest led flash for photographic equipments, smart phone, DSLR.TBC, can provide 3 kinds of powerful lighting model to fit for different kinds of situation. 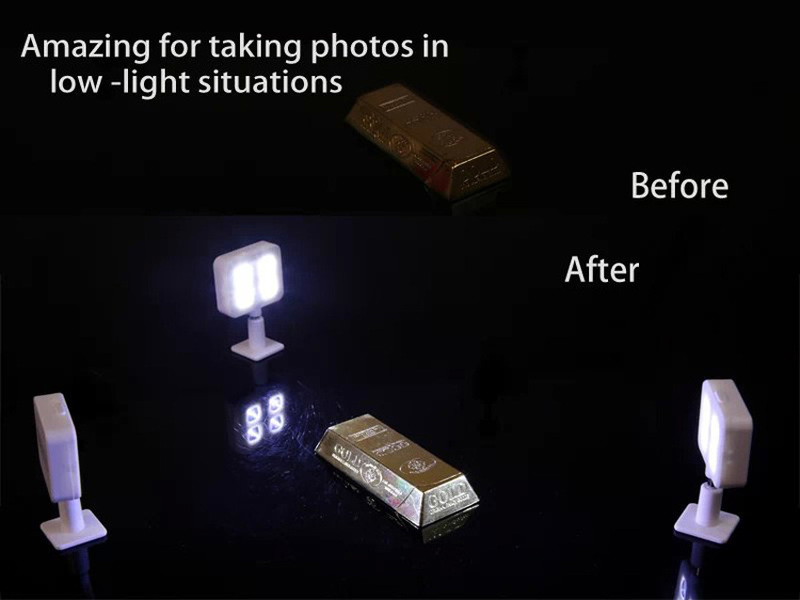 It can provide a sharp contrast in light efficiency. 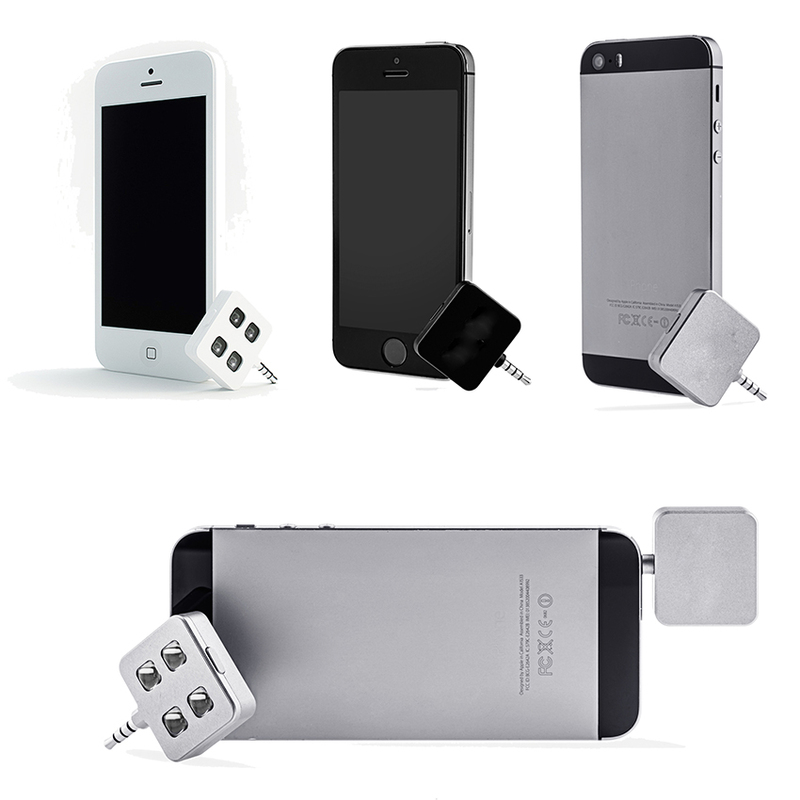 5：Built-in battery no consumption power on your devices. 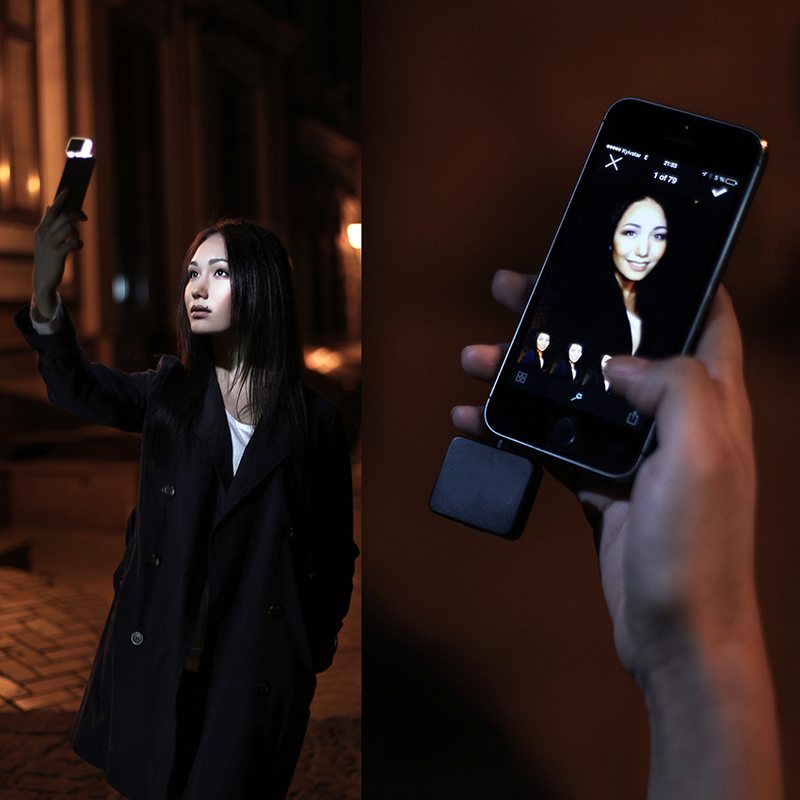 Act as a flashlight emergency.We designed photo and video mode. 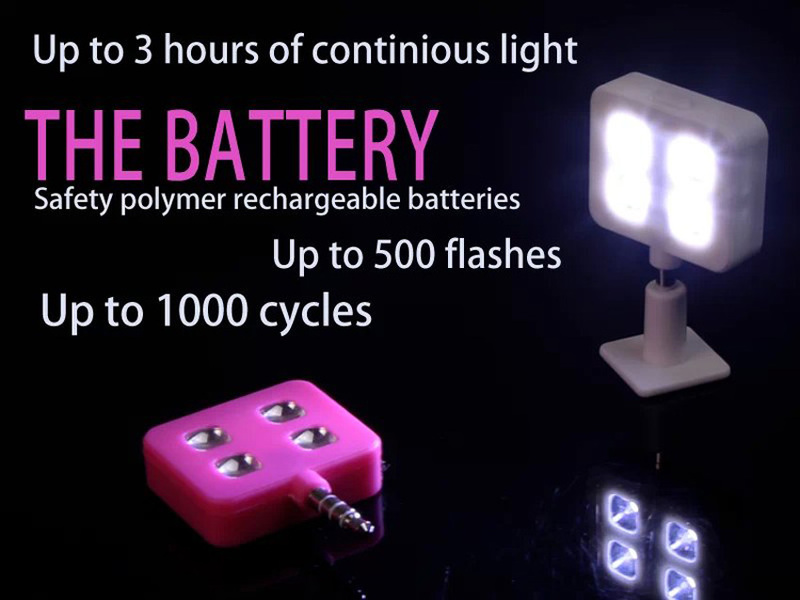 It also can be used as a light during the lighting model without connecting any devices. 6：Sync flash. 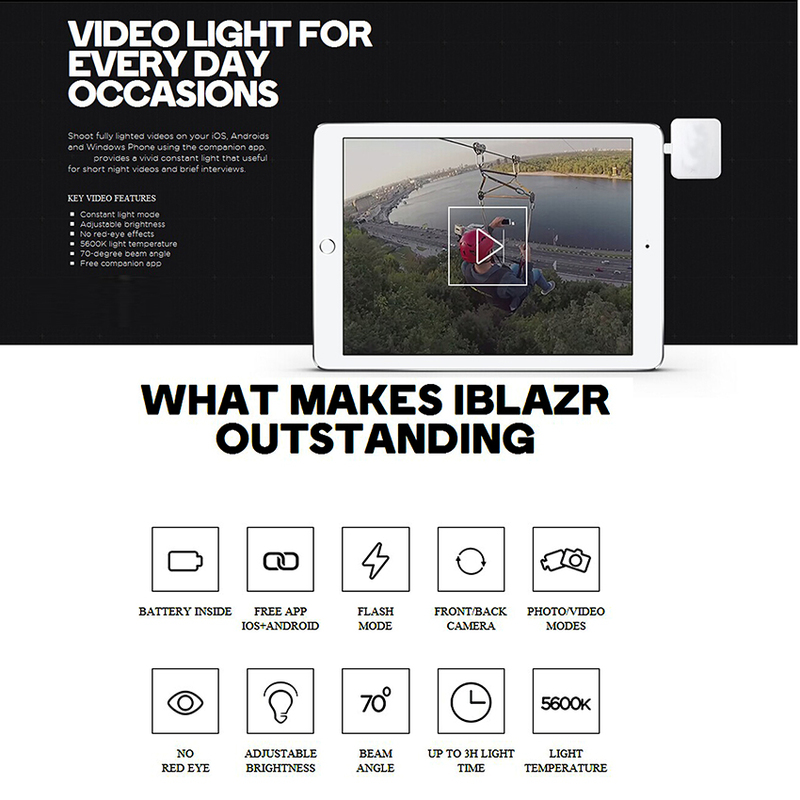 Can free use in IOS Android and WP8 smart phone and pad (free download app iblazr), when installed the app, can sync flash when using your phone camera. It also can reduce the red eyes and lighten the whiteness. As a result, the selfies becomes better. 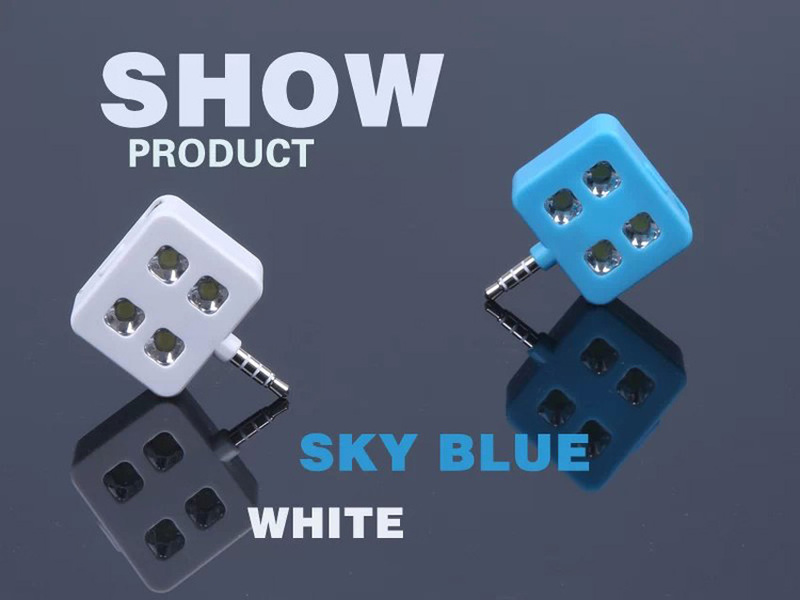 It will be standby model without using the camera. 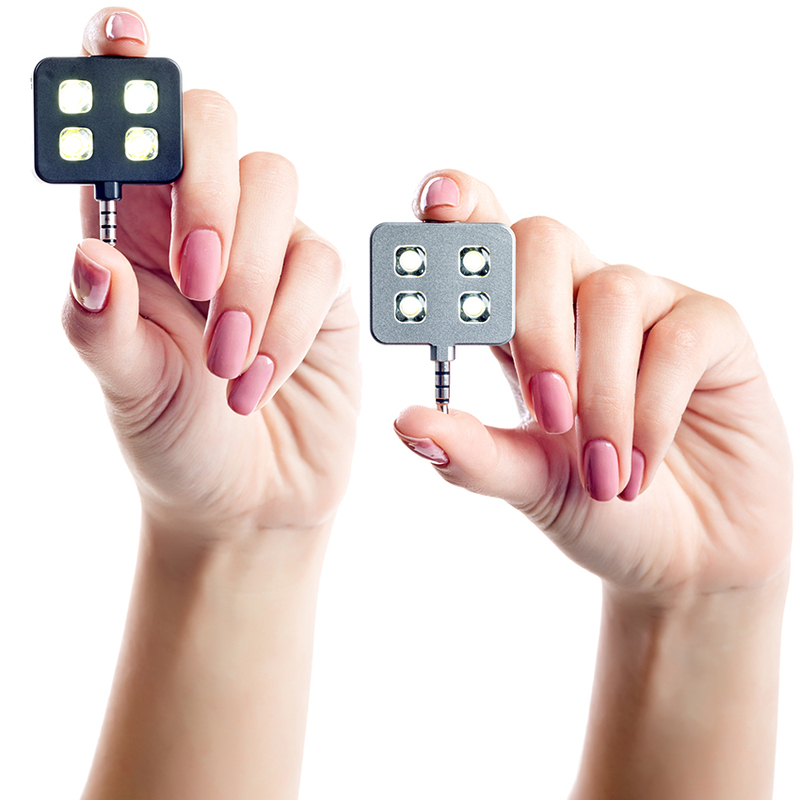 The high light led light will hurt the skin and too bright to take pictures. 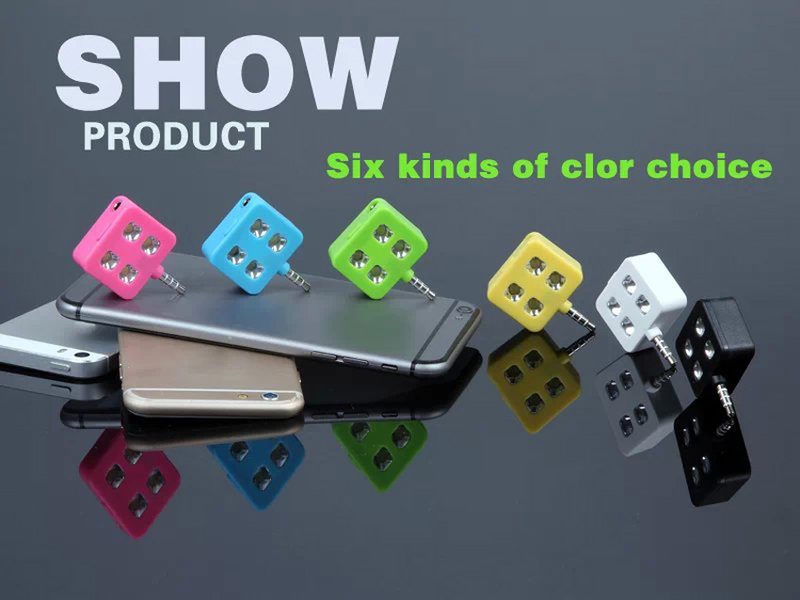 7: Mini size, easily use. 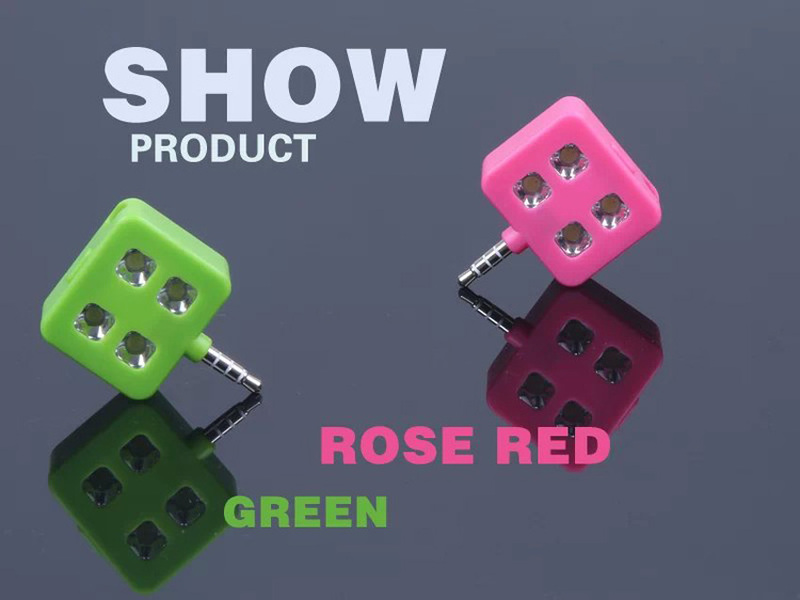 White, black, blue.green.pink, yellow six colors are available. 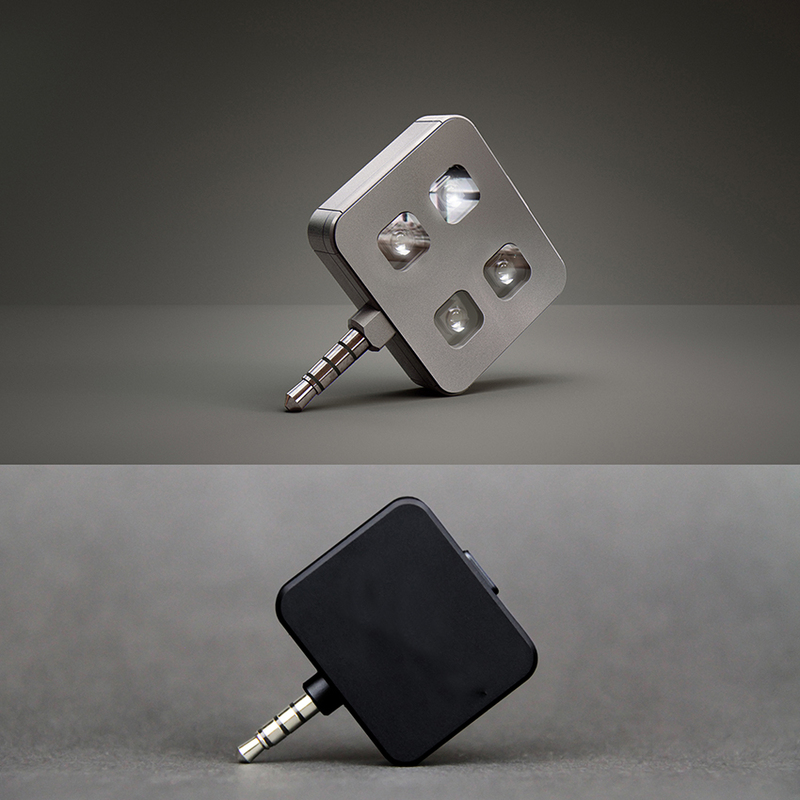 Connect by 3.5mm audio jack port. 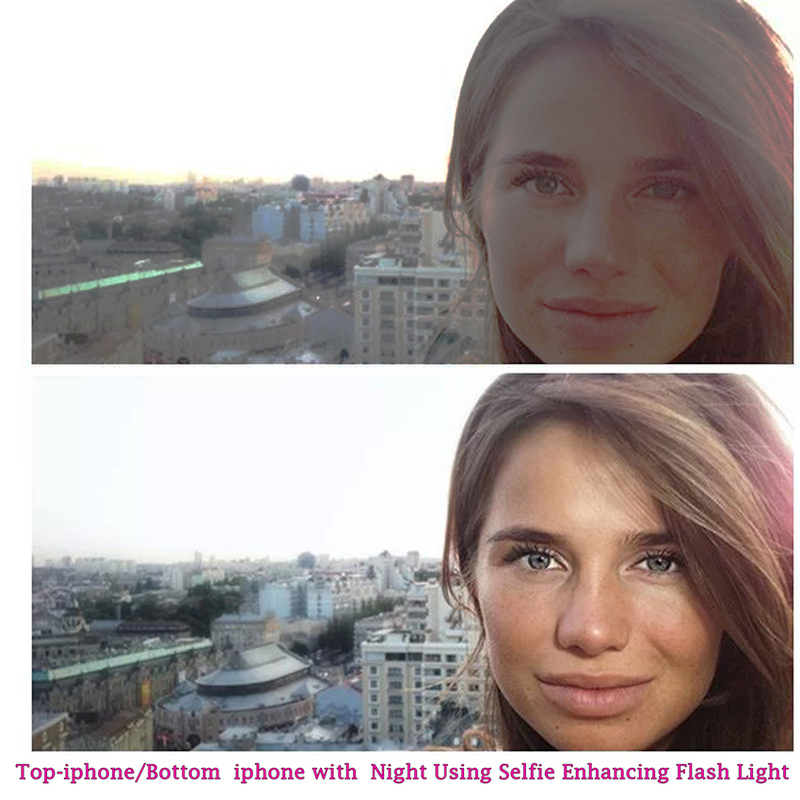 When using for selfie can enhance the effects of your pictures. 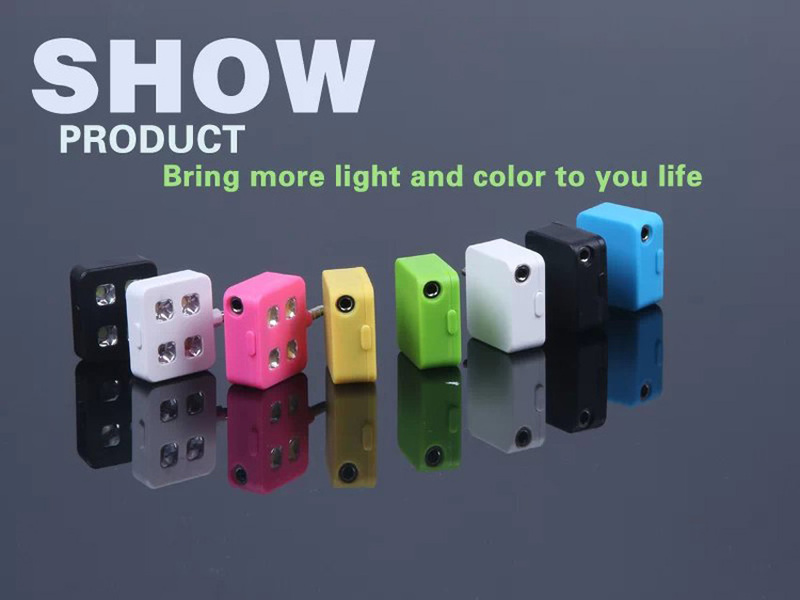 There is a power button in the top of the machine which can control the brightness and 4 led lights in the front side. 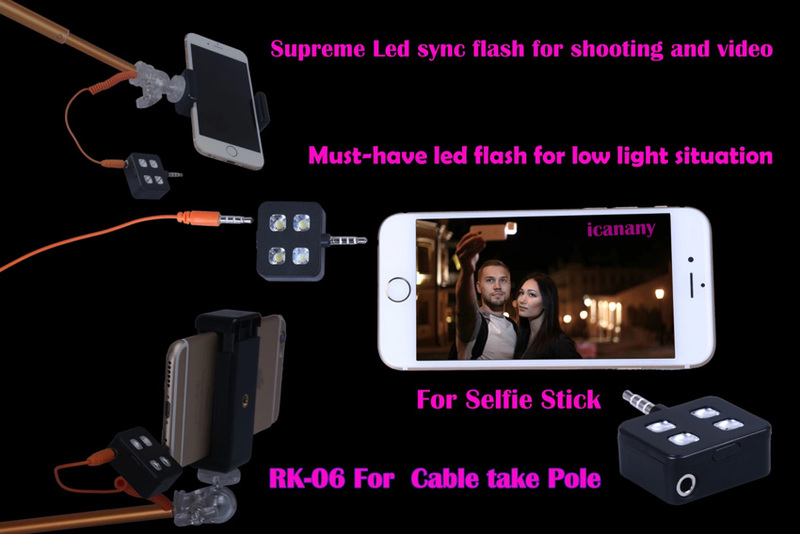 •The world’s first sync led flash for mobile phone, easy to use! 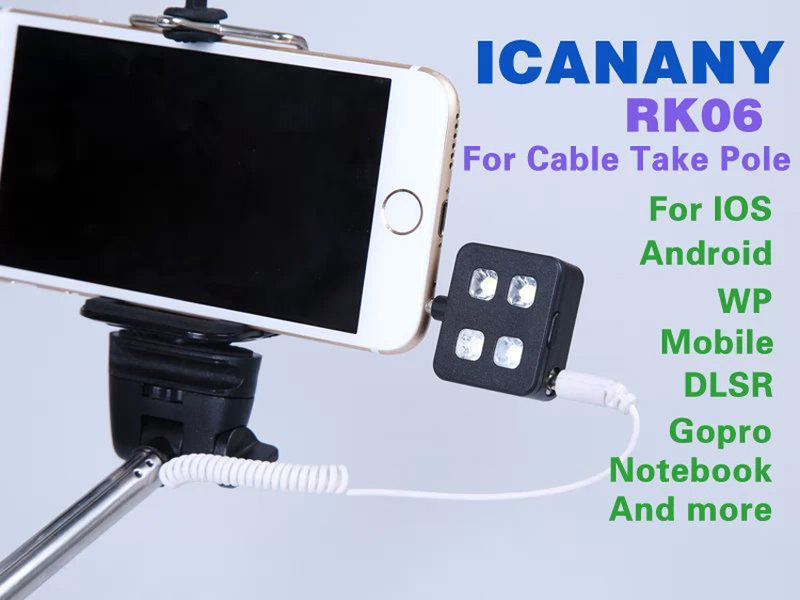 Compatible:For ios system can suit for ios 6, 7, 8 versions For android system can fit for 4.0 or higher version For window 8.0 and higher version It can be used for moveable devices and other normal camera with the hot shoe mount. 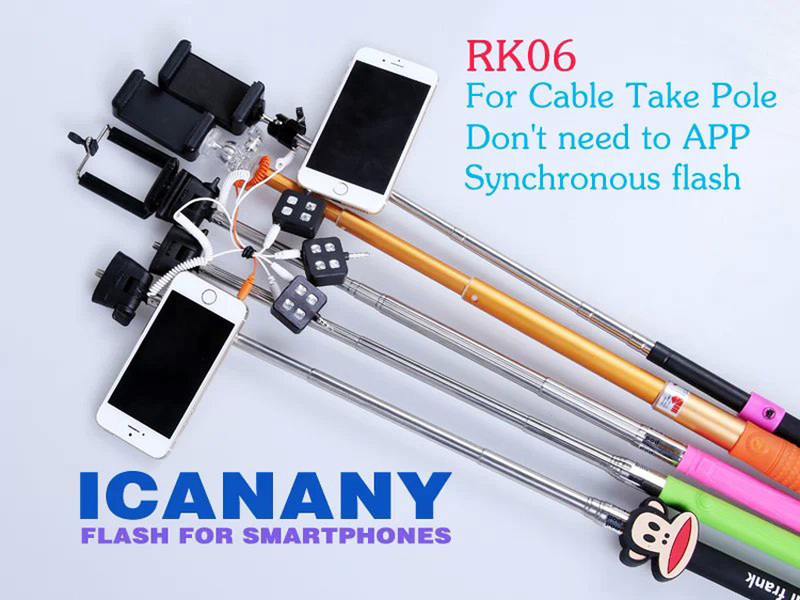 No need app can be the sync flash when using with wire selfie stick. 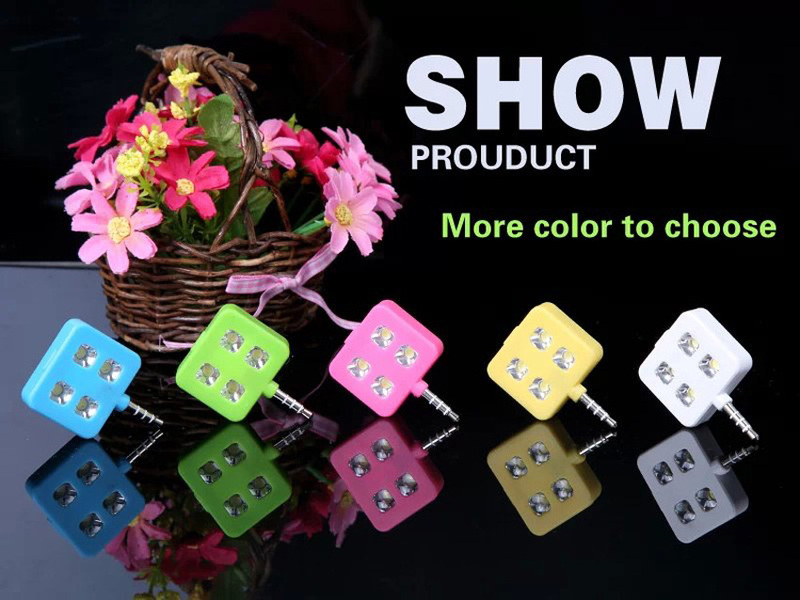 Led light will flash and then out, then need to press the button, the lowest light will on, press more, the light will enhance. 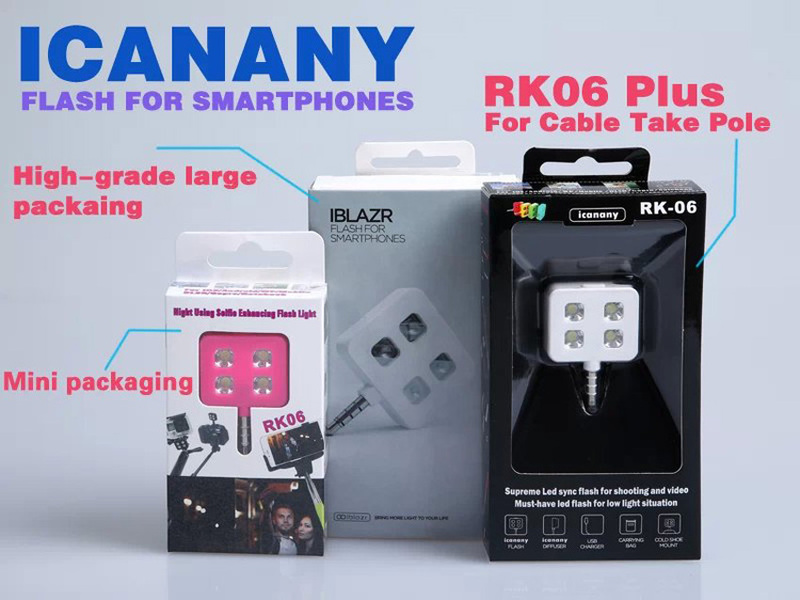 Rk06 can be compatible for smart phone and pad, devices with camera function, it can used for ios and android systems. 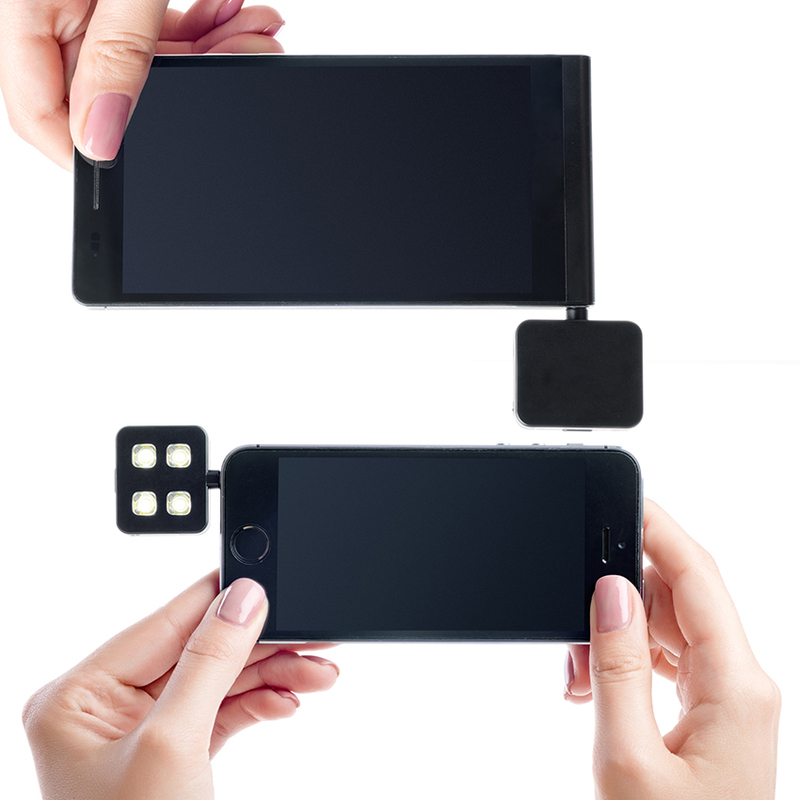 It supports to change from front camera and rear camera. 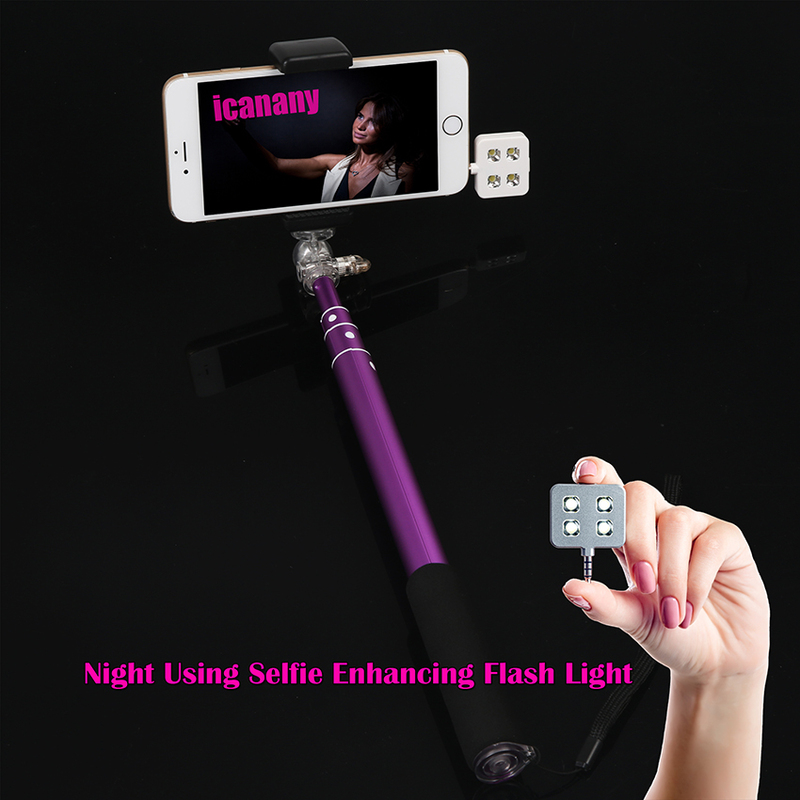 When take selfie, you can power on the light all the time to get higher quality pictures. 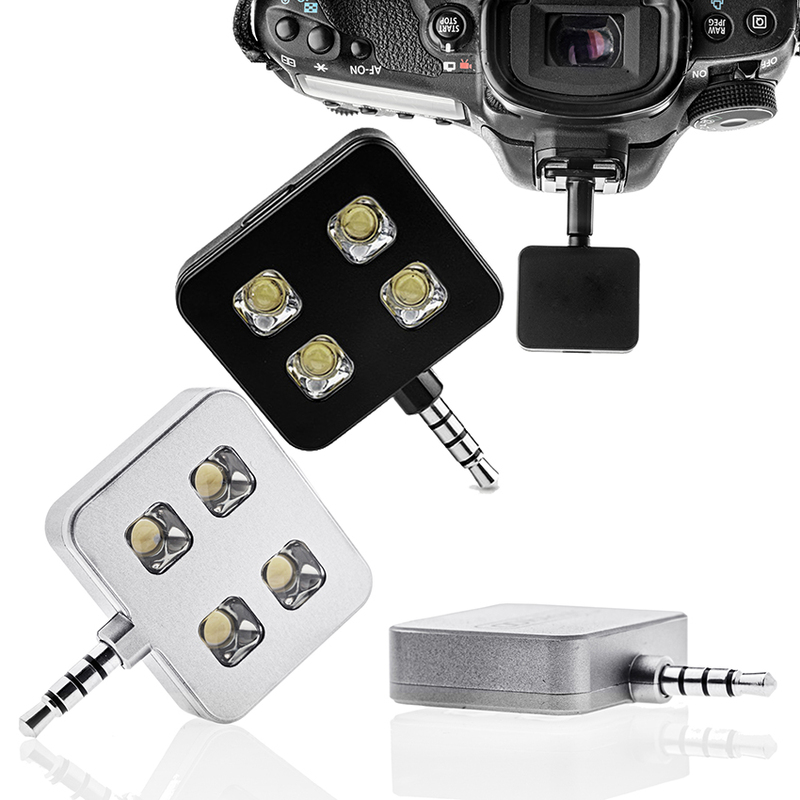 For using rear camera, can add the led light and using the built-in flash at same time. 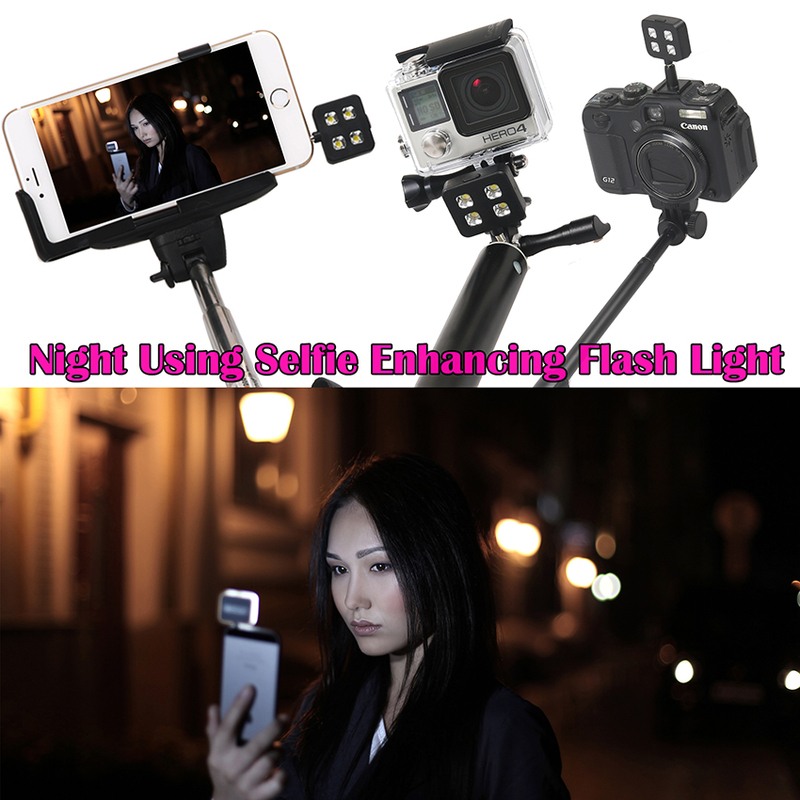 Replace the built-in flash of phone and pad. The light is the key matter for taking photos. There are lots of advantages to take pictures by using phone. 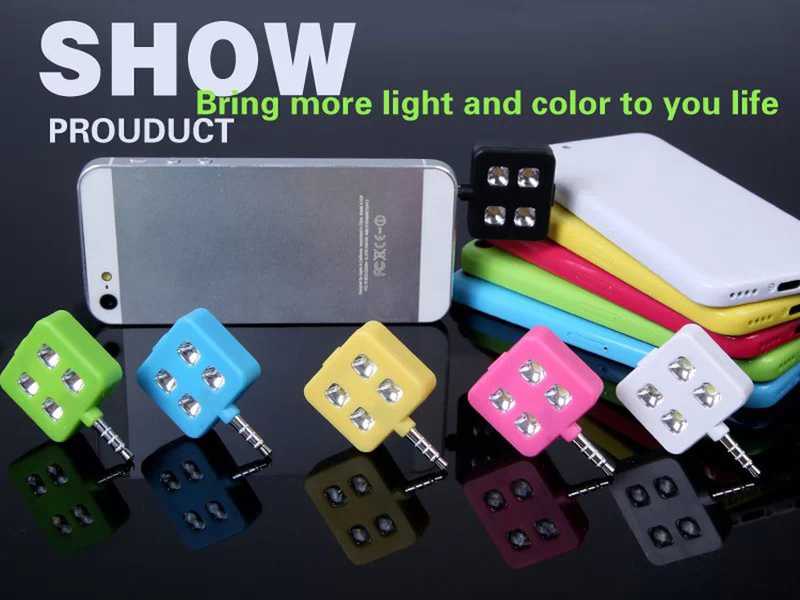 However, comparing with advanced photographic equipments, the effect of using cell phone is vague so the light is quite important. 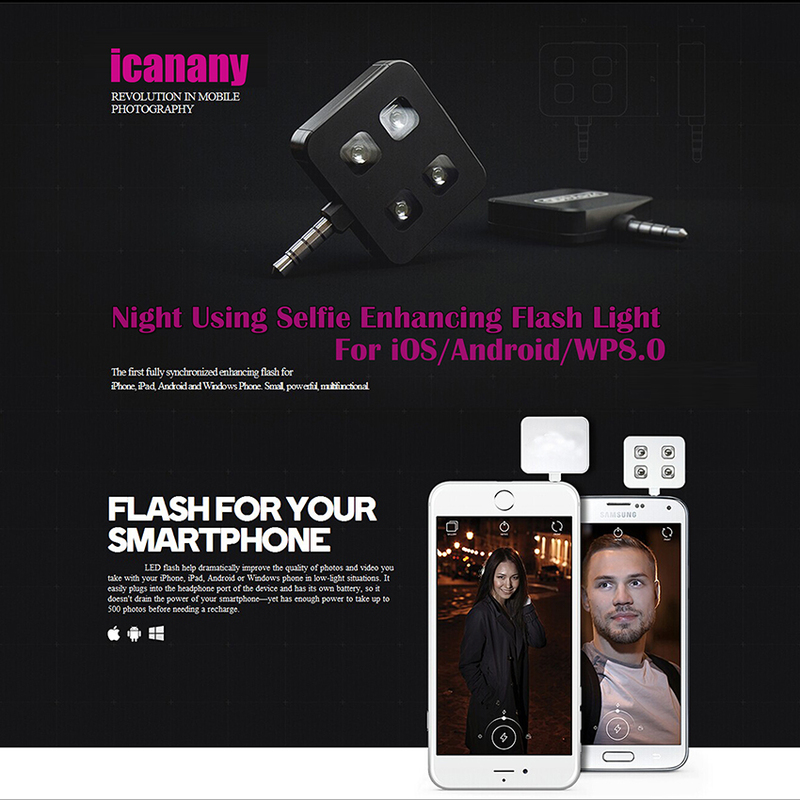 While if you use icanany led light which is the new selfie product, can add light. Cold and hot shoe mode. 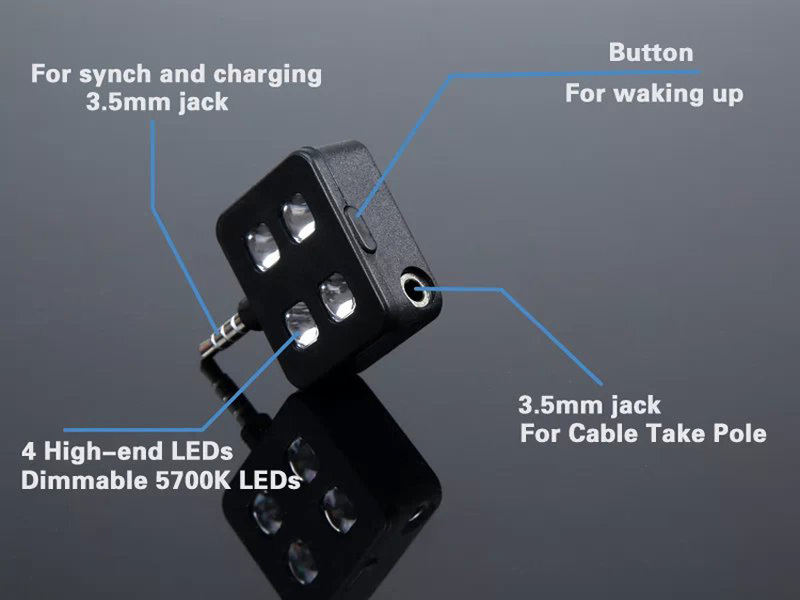 The smallest led flash which can be suitable for DSLR, Canon EOS and PowerShot series. Nikon D series. SONY NEX and RX series, Samsung NX.